Once you've used Website Builder to add contacts, you're ready to create an email "campaign" using a newsletter or flyer. 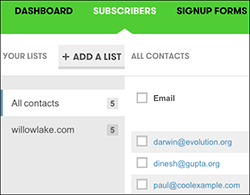 When Website Builder launches, click the Contacts tab, and click Create Campaign. Note: If you already have one or more GoDaddy Email Marketing accounts, you'll be asked to choose which to use. Otherwise, you're taken directly to the GoDaddy Email Marketing account Campaigns page. 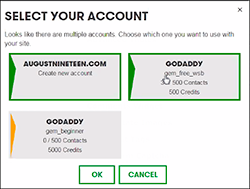 Your free GoDaddy Email Marketing "starter" account opens and displays all your Website Builder contacts on the Subscribers page. Note: It may take a few moments for the intial All Contacts count to update. To create a newsletter or flyer for your email campaign, click the Campaigns/strong> tab within GoDaddy Email Marketing and see the Next Step below. Use GoDaddy Email Marketing to create a promotional email newsletter or flyer.